In June, 1993, three hundred American Muslims gathered at Dar al Islam in northern New Mexico at reputedly the most beautiful work of adobe architecture in the world. Situated high above the Chama River this mosque complex overlooks the high desert plateau surrounding the old Spanish city of Santa Fe against a backdrop of the snow-capped Sangre de Christo Mountains, the southernmost extension of the high Rockies. If any place can elevate one?s vision beyond the here and now to the infinite beyond, this is it. The founder of Dar al Islam, Nuradeen Durkee, a decade earlier said that he chose this environment as ?space for a new generation to worship their Creator and learn anew the timeless Way to walk in harmony and peace and thus fulfill the purpose for which we human beings have been created and brought to light.? Sheila Musaji, chose this site as the ideal location to reflect on the growth of Islam as the second largest religious group in America and to celebrate the transition or return of the native-born Muslims as the new majority among Muslims in America at a time when Islam promised to become a major force in mainstream society. The goal of the first North American Muslim Pow-Wow, she said, was to bring together Muslims who are rooted in the soil of North America. The term ?Pow-Wow? was chosen because this originally Algonquin word referred to the gatherings of the tribes across the Great Plains to strengthen their spiritual power as a great federation of peoples and to make decisions by mutual consultation on shaping their own future. 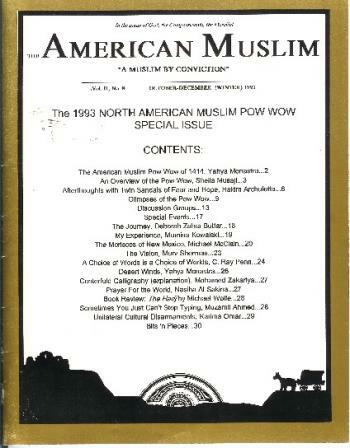 The motto on the masthead of Sheila?s scholarly magazine, The American Muslim, was ?Muslims by Conviction.? This did not imply that ?born Muslims? are not Muslims by conviction. The purpose of the journal was to serve those who were bold enough to choose Islam as their path to God but needed to create their own support group in order better to face the unique challenges that they faced otherwise alone. The first Muslim leader among the Navajo, Abdullah Hamza, who represented the new Muslims in America?s largest Native American nation, articulated the challenges to American Muslims in his own cultural analogy, ?Muslims today are like a big snake sitting on a treasure chest (Islam) and frightening other people away.? This chest must be opened, he said, because, ?We are living in the time of an attempt to establish a new world, without religion.? America is the leader of this new world, and it has much good to offer, but it needs to revive the traditionalist wisdom of its founders, who derived much of their thinking from the Native American peoples who preceded them in populating this great land. The Director of Dar al Islam and host of the Pow-Wow, Hakim Archuletta, modestly has stated that the pow-wow was inevitable because events directed by Allah outstrip human agendas. The growth of Islam in America as a source of wisdom to help Americans revive the best of America?s heritage was not deliberately planned. But ancient Hopi prophecies state that a great white people will come from the East and bring great tribulations, but that the wisdom of the People will save them from themselves. The Pow-Wow, according to Sidi Hakim, represents at least the ?possibility of this happening.? The central theme of the Pow-Wow was what he called Islahu Dhat al Bayn, which might be translated as the emergence of what he called ?the essence [dhat] of ourselves as Muslims.? Jeremy-Henzell Thomas calls this our ?transcendent identity.? This can also be expressed as our selves within the greater framework of transcendent law, which is the divine ordering of the universe evident in the diversity that points to the Oneness of God. Others described the purpose of the Pow-Wow as a badly needed effort to demonstrate and nurture the tolerance among diverse persons and groups that is associated with classical Islam. Actually, the purpose was much greater than that. Tolerance, even in interfaith circles, can mean merely that I will not eliminate you yet, but I will as soon as I get a good chance. The Qur?anic statement by God that I have created you as diverse peoples in order that you may know each other, calls for a higher level of thought and action, which respects diversity at least as a fact of life, if not of one?s own choice. And this, in turn, is merely a step toward the highest level, which we may define as pluralism. This calls for everyone to welcome what wisdom other people have to offer if only because one knows that one has much to offer them. This highest level of human interaction both within each religion and among them precludes assimilation of Muslims within American society, because assimilation is suicide. It also precludes the adoption of a ghetto mentality of alienation and confrontation, because this also is suicide. Rather, the pluralist paradigm calls for Muslims and others to integrate into American life by bringing the best of Islam to help everyone revive the best of America so that America can again become what the Founders envisioned, namely, a moral leader of the world. Dar al Islam?s Director of Economic Development, Anas Coburn, described the unity sought at the Pow-Wow as ?not unity of point of view, not uniform attainment of an ideal of courtesy, but unity in the sincere struggle to hear and appreciate each other.? This was both a spiritual and an intellectual jihad. And a jihad it turned out to be. Everything was not peaches and cream. Mumina Kowalski, ever the pragmatist and opponent of whitewash, described this jihad, which began in the caravan of twenty-one Muslims from Washington, D.C., to their Makkah two thousand miles away at Dar al Islam, as follows: ?Deep underlying problems became exposed. Complaining and rudeness grew like evil weeds overrunning a potentially beautiful garden. Lack of tolerance, prejudice, anger, hypocrisy, over-confidence, abuse of power, passivity ? all were there, [as well as] marital problems, fear of others, and clinging to one?s prejudices. Those which we can usually hide were forced to the surface as well.? But, she adds: ?The good moments of our caravan were so good I would probably do it all over again. Despite having to face the whole range of the Ummah?s problems, there was enough love and true feelings of brotherhood to see us through to our final destination, al hamdulillah.? At one point during the Pow-Wow, an Egyptian husband of an American-born Muslima proceeded to beat up his wife in full view of a hundred other Muslims because she had not told him that Sufis would be there. I immediately started rounding up some men to beat up this man as punishment for his crime. This was when I was still somewhat of a Taliban Liberal, if there is something so oxymoronic. Fortunately, wiser heads prevailed, and the unfortunate Muslima was sent to a shelter for battered women and a secret life, which she still leads today. Only a year ago, a decade later, this same ex-husband threatened Sheila Musaji?s life if she would not reveal his former wife?s whereabouts. In her own understated way, Sheila Musaji remembers that at this Pow-Wow, ?In an effort to find common ground the few negative persons were simply overwhelmed in a tide of good will. Very lovingly but very firmly they were stopped from bringing their disharmony and disunity to cast a shadow on the gathering.? Mohamed Zakariya recommended in his assessment of the Pow-Wow: ?Sowers of venomous discord and hatemongers should stay home next time.? In her ode to the Pow-Wow, Sister Mumina proclaimed, ?Who are the Muslim Americans? I met them at Dar al Islam. It was the best; it was the worst. It was a Pow-Wow, only our first. ?